Mrs. Claus sat in her rocker, a half completed sweater resting on her lap. The alarm clock on the small table beside her rang its shrill alarm through the warm air of the house, announcing that it was now 1am. She reached for it, hitting the button at the top with a light ting and silencing the sound. She cranked the dial back another hour so that it would ring at 2am. This was how we kept track of Santa’s journey on Christmas Eve. The kitchen counters were covered with cooling racks of sugar cookies decorated with red and green frosting, pinwheel cookies with chocolate and coconut layers, and almond shortbread cookies dusted with powdered sugar. Several pies cooled in the window, the chilled glass absorbing their heat to create a moist fog that blurred the snowy wonderland outside. I had made apple and pumpkin pies as well as some meat pies with the beef leftover from the cows we had in the summer. Meat pie wasn’t something we normally had at the Christmas feast, but it had been Horith’s favorite and I wanted to honor him. To feel like he was still included in the celebration. My heart stung at his memory and my eyes watered. I wanted to fall to the floor and cry, but it was Christmas and I had to put on a happy face for the younger elves. I swallowed my pain down and forced myself to smile as I worked. I would be able to cry later in the quiet safety of the barn, away from the observant eyes of Mr. and Mrs. Claus. Once the cookies were finished baking, Chandrelle started to roast the Christmas ham. The boys, who were now busying themselves with the stables, had slaughtered the pig earlier that week. Fresh potatoes and corn harvested at the end of the fall and root vegetables from the cellar would complete the feast. Santa always came back on Christmas hungry, even after eating the treats left by little boys and girls all around the world. Once he returned, we’d all celebrate the success of the holiday with him. It would be joyful to have everyone enjoy the sweet and savory treats created by me and Chandrelle. This year there were twelve of us elves. Chandrelle and I were the eldest. 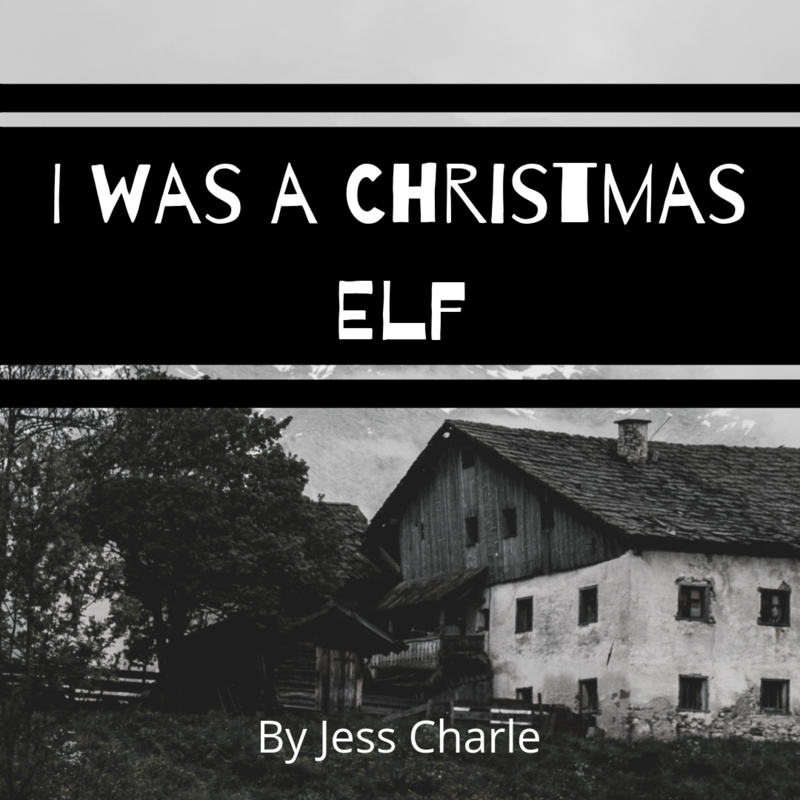 At nineteen, Chandrelle was the oldest elf I had ever known. I had always joked that it was her baking skills that kept her alive so long. I was the second eldest at sixteen. Until Thanksgiving, it had been Horith who was the second eldest. He had been seventeen. Horith and I had been very close. Our love ran deep and constant like the river that bordered the North Pole on the south side. Being one of the two eldest female elves came with a lot of privileges and responsibilities. We were not only expected to take care of the younger elves, but to help Mrs. Claus with running the house, which meant also the barn and the cellar. We were the only ones that she would entrust to protect the food storages since some of the younger elves would be less able to fight temptation during times when food was scarce. After Chandrelle and me was Myrin who was fourteen. Then there was Erolith who had just turned twelve and Zaltarish who was eleven. Cystenn was nine, the twins Arazorwyn and Biafyndar were eight, Pleufan was seven, and Alok was four. Then there was sweet Quaeth, who was the second youngest at one year old. And finally there was precious little Nym, who was only six months old. She was to spend the holiday tucked tightly in her crib, drunk on breast milk and dreaming of sugar plums. I had a special bond with Nym because she was the first elf harvested from me. After years of fearing that I wouldn’t be able to contribute new elves to the Pole, Nym finally came along. My little miracle. When Santa had punished Horith I worried he would take his anger out on Nym as well. I begged him to spare her, that it was only me who was a threat to the joyful life at the North Pole. I will always be thankful to Mrs. Claus for saving our lives that night, even if her motives were only driven by concern of our small number. Her frantic cries warned Santa that losing two adult elves would be unwise in the harsh winter months and even losing one infant would make the future difficult. At Mrs. Claus’ pleading, he decided to show us both mercy that day, only locking us in the shed for a week as penance for my failings. See, the North Pole is a wonderful land of celebration and joy, but also of discipline and reverence. We elves have few rules we must follow, but disobedience is not an option. Rule #1: Do your chores. The eldest female elves looked after the home and the food reserves in the barn and cellar. We baked, cooked, pickled, cleaned, and did all the sewing. The eldest male elves looked after the animals and performed the butchering. Sometimes, under Santa’s supervision, the boys would be allowed to travel north towards the mountains to hunt rabbits and deer. Chandrelle had always envied their trips away. Neither of us had ever traveled past the tree line. Horith would tell me all about the animals and the views that he saw during those trips. We’d sneak to the barn late at night and lie together in the hay. He’d tell me about about how rocky and steep the mountains grew as you approached them and how beautiful the sun was setting over the Pole. After their tenth year, elves were expected to help look after the crops and contribute to the harvests. It was tough work for such small bodies, but we all had to do our part. Horith had been so good about helping the little ones with their more difficult chores after he had finish all of his. When they weren’t in the fields, they either took care of the younger elves or assisted the older elves in more detailed tasks. This also helped them learn the jobs that they would soon be expected to perform. The youngest elves were in charge of the easier chores, such as taking care of the chickens and collecting eggs or helping with the gardening. When all the elves did their chores, the North Pole ran smoothly. Like a well-oiled machine. Even this past year with only twelve of us, we were all able to survive. And it was indeed lucky that Chandrelle and Myrin were both ripe with the next generation of elves, promising that our numbers would grow again. Rule #2: Always be joyful. Mrs. Claus told us that a smile is all you need in this world. That it is a conduit for joy. When we felt bad things she’d shush us. “Santa does not like it when elves cry.” She’d warn. But sometimes it was hard, especially for the little ones. We’d remind them to try and be joyful even when they had stubbed their toe or skinned their knee, but still the tears would flow around their frowns. We’d tell them that it’d get easier as they grew older. They’d sniffle and nod and we’d smile at them, rewarding their joy with cookies and candy. What I never revealed was that it was difficult to be joyful sometimes, even as an older elf, and so I had to pretend. When Mr. Claus could see my unjoyfulness seeping through my smiling face, he’d tell me to be more like the other elf girls. To be more like Chandrelle or Mrs. Claus, whose warm smile never faltered. Mrs. Claus with those ice blue eyes, crinkled permanently by a wide toothy smile. Mr. and Mrs. Claus said that elves were always joyful, so I used to worry that I was defective. But then I started going to the barn at night with Horith and he told me that he wasn’t joyful sometimes too. I told him about how I was often not joyful. He looked me deep in the eyes and told me he felt the same. Telling him that oddly made being joyful easier. Rule #3: Only Santa may leave the Pole. The only exception being when he would take the older boys hunting. Otherwise, only Santa was able to come and go. And he didn’t leave only on Christmas Eve, but would leave the Pole once or twice a month. I once asked Mrs. Claus what Santa did when he left and she explained that he needed things that we couldn’t provide at the North Pole. Despite her unfaltering smile, she’d sympathize with us, the girl elves, on those nights. These were the nights when Santa would visit us in our room. Most of us wouldn’t be able to sleep those nights, not when we knew what was coming. He’d waken the few that could early in the morning, our thin door banging against the wall. The sound would always vibrate through my bones as a sour scent permeated the room, making the warm air heavy over my mouth, forever forced into a smile. He’d pick one or two of the girl elves and carry us out to the shed where he would ready us for harvesting new elves. It wasn’t at all like when Horith and I would go to the barn. That would be soft and painless. It hurt when Santa sowed us. I was lucky though. Chandrelle was his favorite, so I was often left alone. There was an unspoken fourth rule at the Pole. That only Santa may harvest his elves. We were supposed to be pure. But Horith and I loved each other. We loved each other so much that our bodies ached to be together. And then Mr. Claus found us. He had been so proud of me too. So proud that I had finally provided fruit for him and Mrs. Claus. It was then that he took Horith to the shed. That was the last time I saw my love, his face twisted in fear and pain as Santa dragged him through the cold dead leaves. I cried for him, openly. Mrs. Claus allowed it, even though it was not joy. She had always been much kinder than Santa. The alarm rang at 6am. Mrs. Claus stopped her knitting and stood at the window, looking out at the winter scape around us. Worry furrowed her brow, slightly wrinkling her otherwise joyful face. Santa Claus had never been this late getting home before. At 11am, Mrs. Claus let us eat some of the feast that we had prepared so that we could go to bed without empty stomachs. I couldn’t sleep though, instead I listened to her walk back and forth by the front windows, waiting for him. At 3pm, the other girl elves and I joined her in the living room. At this point, she was curled up on her rocking chair. She wasn’t crying, which I was surprised by. Despite Rule #2, I understood the hurt that happens when someone you love doesn’t come back. Yet instead, Mrs. Claus rocked back and forth, her eyes glazed, staring out into nothing. She was unresponsive. Her lips drawn tight, making her grin look dehydrated and skeletal. By the time 5pm hit we abandoned her to feed the younger elves more of the Christmas feast which now lay cold on the table. At 8pm, Chandrelle called out for me to join her at the window. I hugged Nym close to my chest as I walked over to see. Chandrelle pointed and I immediately saw the shadowy figure which had just emerged from the treeline. Mrs. Claus jumped from her chair, pushing us aside to take a look. “Oh thank God! He’s back!” She cried, the practiced smile of joy stretching her face wide again. We continued to look over her shoulder as another shadowy figure appeared, followed by another. Soon, several shadows were walking towards the house. Mrs. Claus’ face went pale and, for the first time, her smile wavered. It felt as if ice water was running down my spine. She ran to the back of the house and came barreling back moments later with a large shotgun. She brandished the weapon in front of her as she ran out the door wearing nothing but her housecoat and slippers. There was a loud bang and she fell into the snow, which quickly turned red around her. We were too stunned to react. Within seconds strange men were around us, touching us and asking us questions in short barks. Chandrelle smiled widely at them, asking if they wanted some cookies and Christmas cheer. Nym and I were the only ones who cried. I haven’t seen any of the other elves since. The men let me keep Nym though, which I appreciate. They gave me a cup of water and a cup of some warm brown liquid I assumed was Hot Cocoa, but it was bitter and earthy. I spit it out and the men took it away. They asked me lots of questions, many of which I didn’t understand. It was like they were speaking a different language. They asked me who my mother and father are, but I don’t know what those words mean. I asked if I could go back to the North Pole, but the men only clenched their jaws without answering. Their features were sharp and their flesh was not snowy white. They were not elves. They all looked different, it was difficult to keep them straight. They were all odd looking. And each of them looked old. Much older than Mrs. Claus. They looked like they were Santa’s age. I am alone now. This place is too bright, too cold, too metallic. The light hurts my eyes and the coldness gnaws at my bones. Tears bite at my cheeks. I try to smile but it is hard to even pretend to feel joy here. The warmth of Nym on my chest is the only comfort I have. She squirms and I look down at her and try again to smile. She looks up at me and her large wet eyes search my features before lighting up with recognition. She smiles at me and my heart lightens. I see Horith’s smile in hers and for the first time since he died, my smile feels real.